Portugal's Alentejo region, the area east of Lisbon, Portugal. produces rich and concentrated red wines that are much in demand by those in the know about wine. The region also produces Vinho de Talha, a wine made in the ancient Roman way by enthusiasts of the method. 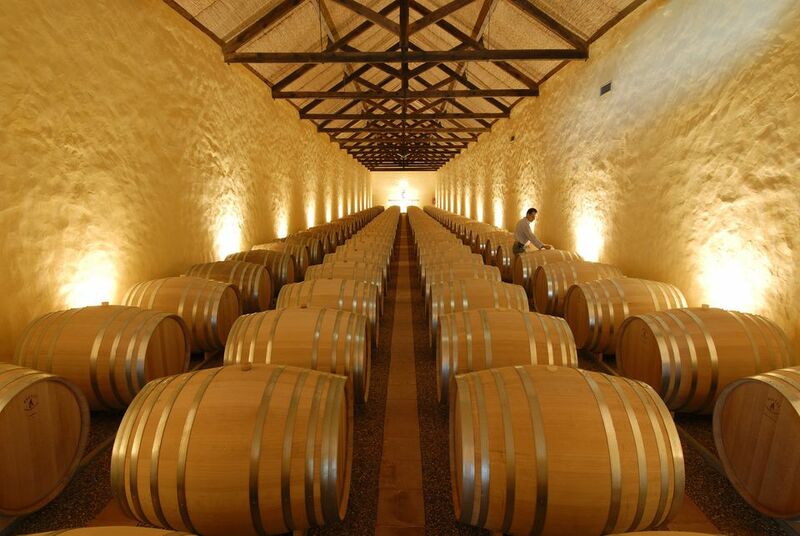 Vinhos do Alentejo has a new website that is translated into English. Here you'll find the location of the region's tasting room in Evora, a UNESCO World Heritage Town in Portugal. The Tasting Room in Évora should be able to answer all your questions and describe the region's three wine routes. You'll also be able to taste some representative wines at the tasting room as well. A good introduction to the wines of the Alentejo region can be found at wineanorak.com: Portugal's Alentejo Wine Region. The Alentejo Wine Route is made up of three itineraries -- the São Mamede Route, the Historic Route and the Guadiana Route -- that cover the entire region and include various wine estates and vineyards. The São Mamede route owes its name to the Natural Park -- one of the main attractions of the region. The Tapada do Chaves and the Herdade do Mouchão are some of the examples of the wine estates found in the towns of Marvão, Portalegre, Crato, Alter do Chão and Monforte. The Historic Route is more extensive and has the largest number of wine producers, encompassing the city of Évora and neighboring cities. The wine estates in this region include Adega da Cartuxa, Monte do Pintor, Roquevale, João Portugal Ramos, Couteiro-Mor and the Adega Cooperativa de Borba. Finally, the Guadiana Wine Route has very different characteristics and is attractive for all those who appreciate nature. Traveling through Viana do Alentejo, Alvito, Portel, Vidigueira, Cuba, Beja, and Moura, visitors encounter the vineyards of CADE (Quatro Caminhos red wine) and Cortes de Cima. If you're staying in Lisbon and want a taste of the best of the Alentejo, you may wish to take the Viator Alentejo Wine Region and Evora Day Trip from Lisbon. Or you may try an introduction for the wine traveler to the more famous vineyards of the Alentejo: Portugal's Alentejo Wine Region: One Region, Eight DOC Labels.